After several years of negotiation, including active participation by indigenous peoples, the UN General Assembly adopted the Declaration on the Rights of Indigenous People in September 2007. The Declaration protects indigenous peoples’ rights to their collective biocultural heritage as a whole, including traditional knowledge and resources, territories, and cultural and spiritual values and customary laws. Although it is not legally binding, 146 countries have adopted the Declaration and so have committed to respecting it. In Peru, for example, when a Declaration is accepted by Congress it becomes a set of standards and principles that need to be applied. If indigenous peoples use the UN Declaration to implement specific provisions in their local governance systems, national governments that have signed up to the Declaration have a duty to respect these provisions. Territorial rights: Article 26 states that indigenous peoples have the right to the lands, territories and resources which they have traditionally owned, occupied or otherwise used. They have the right to own, use, develop and control these. States shall give legal recognition and protection to these lands, territories and resources. Bio-cultural rights: Indigenous peoples have the right to practice and revitalise their cultural traditions and customs (Article 11). “Indigenous peoples have the right to maintain, control, protect and develop their cultural heritage, traditional knowledge and traditional cultural expressions, as well as… genetic resources, seeds, medicines, knowledge of the properties of flora and fauna…” (Article 31). Decision-making rights: Indigenous peoples have the right to participate in decision-making in matters which would affect their rights (Art. 18). 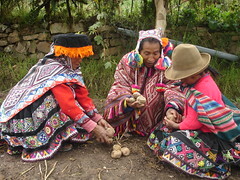 Indigenous peoples have the right to self-determination (Article 3).